In this time of confusion over moral living Pope Francis has appointed a new prefect to the Congregation for the Doctrine of the Faith. Outgoing Cardinal Müller backed the four cardinals who sent the Pope five dubia in an effort to seek clarification of Francis’ position on disputed passages in Amoris Laetitia (to read click here http://www.ncregister.com/blog/edward-pentin/cardinal-mueller-to-be-dismissed). The below article points out issues in Amoris Laetitia separate from the those in controiversial chapter eight. In this chapter we read the notorious comment “it is possible that in an objective situation of sin – which may not be subjectively culpable, or fully such – a person can be living in God’s grace” (Amoris Laetitia, 305). The below article brings to light other problems in this exhortation (the red highlights are mine). 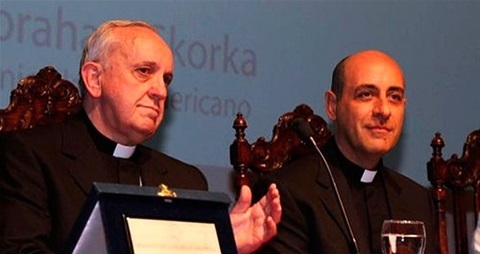 And Fernandez the papal ghostwriter—as Michael Pakaluk and Sandro Magister have shown—repeatedly plagiarizes his previous work in Amoris Laetitia. For instance, Fernandez’s 2006 declaration that “Trinitarian” love can be “realized within an objective situation of sin” is echoed in Amoris Laetitia 305. In his book The Francis Project, Fernandez laments that conservative “fanatics” can’t accept that the “Spirit”—which can “elude the supervision of the institution of the Church”—is leading us “toward a different phase.” It’s a phase where, apparently, God is “Mother” and “you should follow your conscience” and “a pope who tells us that God wants us to be happy on this earth will never ask us to be obsessed with sacrifice.” It’s a phase where, to quote Pope Francis, the Church isn’t “obsessed” with abortion or sexual ethics either. It’s a phase where, to quote Evangelii Gaudium, “time is greater than space”—where “initiating processes” in politics and the Church advances a “utopian future” with “no possibility of return” (222). It’s a frankly eerie “final cause”—“the greater, brighter horizon of the utopian future … which draws us to itself” (222). Hence a revolution through an “incremental change of praxis” across time. Slowly, inexorably, “region by region, bishops around the world begin to ‘interpret’ Amoris Laetitia” subversively—“to a point of no return.” Buenos Aires, Rome, San Diego, the Philippines, Malta, Germany, Belgium, and Sicily have one by one embraced Communion for those in adultery—with some areas earning direct praise and thanksfrom the pontiff. No happy bromides about non-condemnation can erase Christ’s fifteen warnings about Hell. No heady defense of sin, no tangled jargon on “time” and “space,” can theorize the Four Last Things out of existence. Cardinal Burke calls us to battle for the eternal salvation of souls; Cardinal Caffarra calls us to testify for Christ and his gospel—currently on trial.